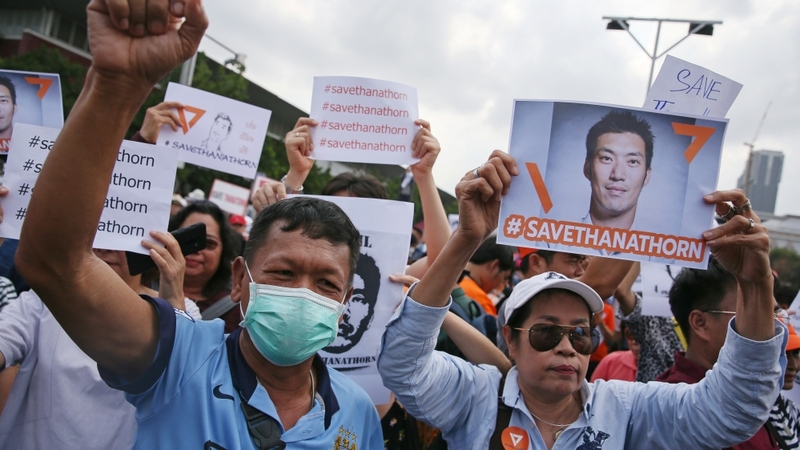 Bangkok, Thailand – Thanathorn Juangroongruangkit, 40, raised three fingers in the air at a crowd of hundreds of supporters and journalists before walking into Bangkok’s Pathum Wan police station for questioning on Saturday. “Thank you for coming out,” he said before entering the building. Thanathorn, the rising opposition leader of Thailand’s popular new political party, Future Forward, met police to address new sedition charges filed against him by government representatives for “causing disorder and disobedience among the public” that could lead to “the acts of rebellion”. And judging by how well the progressive and youth-favoured party did, many observers suspect this latest round of legal charges are a response to Future Forward’s commitment to undo the legacy of military rule and undertake democratic reforms. The sedition charges were filed just a day after Thailand’s army chief, General Apirat Kongsompong, warned supporters of anti-military government parties, like Future Forward, and anyone who threatens Thailand’s constitutional monarchy, to be cautious. He said that the military will do whatever is necessary to protect the country’s “Thai-style democratic system”. “The army does the army’s duty, which is to protect, maintain, and defend the institutions of nation, religion, and monarchy,” General Apirat said on Tuesday. “It’s clear now that the old-school political game won’t end after the election, but is only getting more intense, because they’re afraid of Future Forward,” he wrote on Facebook. “They’re afraid of our wins that exceeded the expectations of many, afraid of politics based only on policies and ideologies that can build faith and support from the public without money or authority, afraid of the truth that nearly 6.3 million people sincerely support Future Forward Party,” he wrote. Immediately after his posts, #savethanathorn shot to Thailand’s top trending hashtags. The charges could have cost the party their ability to run – as the Election Commission could have disbanded them. Police have also summoned prominent opposition activist, Nuttaa “Bow” Mahattana, and a local news commentator for VoiceTV, Sirote Klampaiboon, for allegedly conspiring to defame the Election Commission through their criticism online. Sunai Phasuk, Human Rights Watch’s senior researcher on Thailand, told Al Jazeera that the legal cases against Thanathorn prove that the military government is using undemocratic tactics to maintain control. “The criminal cases against Thanathorn show the military government’s contempt for the rights to freedom of expression and peaceful dissent. It a glaring example of how draconian laws are the pulled out of thin air and arbitrarily enforced to punish the prominent opposition leader,” he said. Two weeks have passed since the country held elections, yet the nation still doesn’t know precisely who won. But the Election Commission released unofficial numbers placing Phalang Pracharat, the military-backed party, in first place, with Pheu Thai, overthrown former Prime Minister Thaksin’s alleged proxy party, in second, and Future Forward coming in third. “Clearly, it’s [the sedition charges] an attempt to weaken the “democratic front” coalition led by Pheu Thai and Future Forward to oppose to the new government supposedly led by Prayuth,” says Prajak Kongkirati, head of the government and politics department at Thammasat University in Bangkok. Ukraine comedian Volodymry Zelensky plays a president on TV. He also wants the job in real life.